I adapted this recipe to make it a bit quicker and much more affordable. The original called for expensive fruits but we selected in-season fruits that were on sale. Apples, grapes, peaches, nectarines, strawberries, and a fresh pineapple. The biggest expense was the pineapple but I wouldn't skimp on that. It makes a beautiful container for the fruit dip and adds a nice citrus element to the fruit salad. After selecting the fruits of your choice, wash and cut into bite-size pieces. If you're not using pineapple or other citrus, add a little lemon juice to keep fruit fresh. Cut top off pineapple, then cut pineapple in half lengthwise. 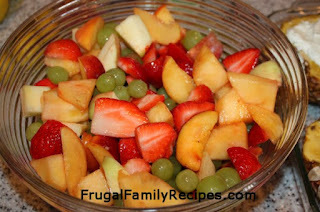 Scoop out fruit and cut into chunks. Add pineapple chunks to salad, and any extra juice. Stir salad gently and reserve pineapple halves for dip. In a separate bowl, beat cream cheese and sugar together until combined. In another bowl, whip cream and T. of sugar until soft peaks form. Combine cream cheese mixture, lemon and zest into whipped cream. Mix well and scoop finished dip into halved pineapple. Cover and chill until ready to serve. 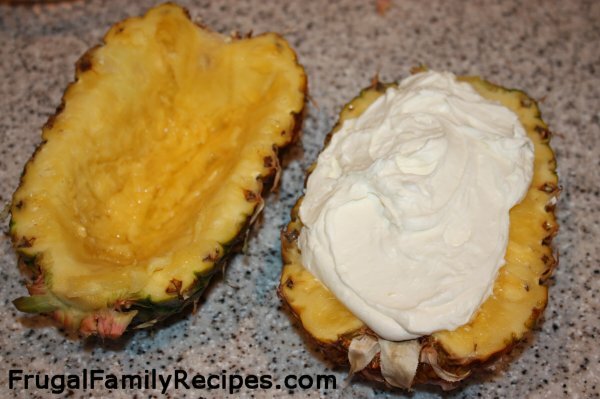 Serve salad with dip on the side, or let everyone get their own from the pineapple. YUM!